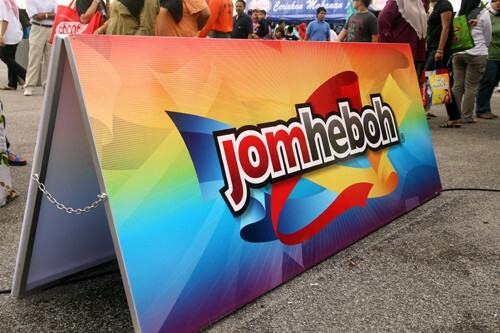 The great crowd pulling event, Jom Heboh 2012 will be once again coming to Melaka City. This time it will be held from 24th to 26th February 2012. The location is MITC, Melaka (Next to Permaisuri Hotel and Subaidah Restoran). With a record number of visitors to 5 million in each year, Karnival Jom Heboh continue to be the best platform for TV3 to reach out to its loyal viewers organized by a variety of healthy activities and entertaining. In addition to interacting and having fun, Jom Heboh also provide business opportunities in which small businesses and medium enterprises (SMEs) are not left together enliven the atmosphere. Indirectly, this can improve the socio-economic status of local traders. This is a wise move to help small businesses to grow their businesses. Karnival Jom Heboh usually began with talk shows “Chat Chat” which was broadcast live on Saturday and Sunday hours 9.30pagi for 30 minutes. In addition to discussing current issues, artists, representatives of authorities and sponsors will be interviewed. Next, the visitors who come to the Jom Heboh will be able to participate in many fun activities in the stalls operating TV3 as Fiction Studio, Studio 3, TV3 Kids, MyTV3, Home and City of Knowledge Newsletter and get the special price of goods in the stalls sponsors.The highlight of the Karnival Jom Heboh is usually Konsert Jom Heboh which will be broadcasted live.